Wok, Bamboo Shovel and Wooden Spoon. Furnish your kitchen with the right utensils for Thai cooking. If you don't own a wok or a food processor, these may be things you'll want to invest in. Other than that, Thai cooking requires few implements; in fact, if you visit Thailand, you'll see simple portable Thai kitchens set up by the roadside or on the beach with remarkably delicious Thai food for sale! The Thai kitchen takes a minimalist approach to tools and utensils. For those whose cooking repertoire already includes Chinese and other Asian cuisines, there may be little to add to your kitchen in terms of equipment. Note that some of the tools may be substituted with more modern appliances, depending on individual preference. Like most Asian cuisines, the wok is central to Thai cooking. Woks are used for everything from stir-fries to curries, and even noodle dishes; they're also used for deep-frying and steaming. This Asian version of the frying pan has steep sides and either a rounded or flat bottom. Woks with rounded bottoms are best for gas stoves, allowing the flames to travel up the sides and thereby distributing the heat. A steel ring accompanies this type of wok, allowing the pan to “sit” over the flames. If your stove is electric, a flat-bottom wok is preferable. In today’s marketplace, there are many types of woks to choose from, and they come at varying prices. Expect to pay more than $30 and up to $200, depending on the type of material used and whether or not the wok is “seasoned”. The preferable size for a wok is 14 inches. Look for woks with sturdy handles and a lid. Cast iron and carbon steel woks are highly recommended; however, try to purchase one that is seasoned. This means the wok has been put through a process of warming, cooling down, and oiling to prevent it from gathering rust and other toxic substances. It is possible to season a wok yourself, but to do so successfully requires patience and reliable instructions. It is much more convenient (and possibly safer) to trust this process to the manufacturer. Avoid purchasing an aluminum wok, as this metal tends to heat up too quickly and stay hot too long (also, aluminum may be an unhealthy choice). Though they are a little more expensive, a good one will last forever! When shopping, look for a thick base at the bottom of the wok, as thin steel will encourage sticking. If you prefer a wok with a non-stick coating, be sure only to use soft spatulas when cooking, and never clean it with anything abrasive. The danger of non-stick coatings is that it can flake off and be ingested; also, most non-stick coatings are environmentally toxic. In general, non-stick coatings are over-rated and unnecessary. Instead, purchase cookware made out of traditional materials (such as iron or steel) and be willing to pay a little more for excellent cooking results. 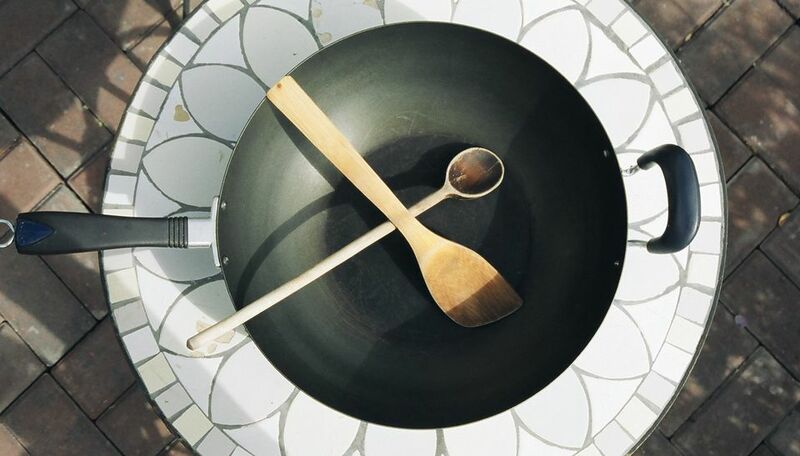 When using a wok, it is essential to have on hand several utensils for stirring ingredients. Wooden spoons with long handles are excellent for this, as are bamboo “shovels”. These are paddle-shaped utensils that allow the cook not only to stir but also to lift ingredients. This tool is very useful for stir-frying noodles, as regular stirring with a spoon tends to break noodles into small pieces (especially fragile rice noodles). Bamboo shovels can be purchased at most Asian stores or markets. Note that if your wok or frying pan has a non-stick coating, it is preferable to use a rubber-tipped spatula for stir-frying to avoid scraping off the surface. This ancient piece of kitchen equipment has remained part of the Thai kitchen for good reason. A stone pestle & mortar easily grinds spices, nuts, fresh herbs, and other ingredients. In Thailand, some chefs have pestle & mortars made of pottery. You can find traditional pestle & mortars in good kitchenware stores or in Asian markets. Note that a food processor is an excellent substitute for a pestle & mortar. When grinding spices, a coffee-grinder is another good substitute. These handy steamers can be purchased cheaply at any Asian grocery store or market. Placed over water inside a wok, they are useful for steaming numerous dishes, from fish to desserts, or simply for healthy steamed vegetables. Good steamers are made of bamboo and come with a tight-fitting lid. Note that the lid should have a sturdy handle to prevent the cook from being burned. These basic tools are useful for preparing vegetables, meats, spices, and herbs for the wok. Sharp paring knives are indispensable in the Thai kitchen; also, make sure you have a good serrated knife for cutting slippery ingredients, such as lemongrass. Buy these handy tools at any reputable kitchenware store. To cook Thai fragrant rice, Thai sticky rice, or Thai black rice, all you need is a deep, stainless steel pot with a lid. The convenience of rice cookers makes them handy appliances to own. One of the advantages of a rice cooker is that the rice stays warm and fresh for many hours after it has been cooked. Unlike cooking rice in a pot, it is virtually impossible to burn, undercook, or overcook rice made in a cooker. Most department stores sell a variety of rice cookers — look for one in your price range that comes with a respectable guarantee.